It is hard to know if the ultimate threats to our existence are real. A small group of people, including a few scientists, say humans will go extinct this century. The cause, they say is a complex of climate disaster, social melt-down, and then multiple nuclear meltdowns. Most of the scientists on Radio Ecoshock agree climate-driven disasters will emerge in multiple forms, but expect humans will continue. In this program we’ll interview a scientist who just shed more light on why mass extinctions happen, and the thresholds that precede them. It’s cutting edge science, but spoiler alert: if you are expecting to witness The End in your lifetime, you may be disappointed. Then we are off to the dense forests of Indonesia, and the vast palm plantations that are replacing them. Many of the products you buy contain at least some palm oil. Others burn it to generate electricity, claiming it is “green” energy. Now with an in-depth investigation by Mongabay, we find out what it really costs. If you don’t care about that, care about this: with little industry or transportation, Indonesia still edges into the number three spot as a huge source of greenhouse gases, at times behind only China and the United States. That matters. Are we headed for a Sixth mass extinction? Experts are asking, and a new paper from MIT brings us more answers. The possible cause of ecological collapse may surprise you. Here to explain is the author, Daniel H. Rothman. He is a Professor of Geophysics at the Massachusetts Institute of Technology. 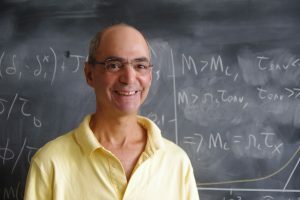 Rothman is also co-director, with Kerry Emanuel, of the Lorenz Center at MIT. His new paper “Thresholds of catastrophe in the Earth system” is open access, so you can read it for yourself. It was published in the journal Sciences Advances in September 2017. Rothman is part of a group of scientists asking “Are We Headed For a Sixth Extinction?” published November 3, 2015 by the Science Philanthropy Alliance. Isn’t Daniel Rothman a great scientific mind? There is so much to what he just said. I recommend you download or listen to that interview for a second time. I did, and took notes. I am not a scientist. But I would like to discuss this interview with Dr. Rothman. These are my own opinions, and any errors are mine alone. Before we get to the nagging questions about what drives extinction, let me emphasize what may have slipped by in this interview. If I understand things correctly, in an earlier work Daniel Rothman studied changes in microbial life at the sea bottom that can increase releases of carbon or methane. We all want to talk about asteroids, or volcanoes, and human emissions. But large-scale changes may come about by forces unseen. Microbes may find our carbon loading as a new opportunity. Whether at the sea bottom, or in newly thawed land in Canada, Alaska and Siberia, the microbial world may intervene heavily in our history. As an aside, if you listen to my very early Radio Ecoshock interviews with Dr. Peter Ward from Washington State, you hear an echo of this microbial threat. In his seminal book “Under A Green Sky“, Dr. Ward says a more acidic sea with less oxygen could bring out a latent microbial life that exhales poisonous sulphur gas instead of oxygen. That may have led to mass extinction in the seas, and on land, according to Ward. But our guest Daniel Rothman is now publishing about very different things. As you heard in this interview, his new paper addresses a long-held theory about how climate change can lead to mass extinction. It has happened at least 5 times in Earth’s history. The explanation often given, including by some guests here on Radio Ecoshock, is that plants and animals are not able to keep up with the pace of climate change. Conditions change too fast, and species go extinct. Rothman tells us that is not the case, or at least not the primary driver of mass extinction. His in-depth studies of the carbon cycle going back hundreds of millions of years gives a different result. It is the AMOUNT of change the drives extinctions, rather than the speed of change. That is a fundamental point that can re-orient future science and perhaps public policy. But I am cautious about this result, precisely because Dr. Rothman is talking about one of the slow grand cycles on this planet. Carbon is taken up by plants, and then released as they die, which is called “respiration”. The rate of respiration is not equivalent to carbon consumption, partly because some animals and plants sink to the deep sea bottom. Their carbon may rest there for centuries or much longer. It’s like a leak in the carbon system. As a result, there is a huge amount of carbon held in the deep sea bottom, much more than found in the atmosphere. My understanding from this interview, is that when thresholds are reached, microbes at the sea bottom can change toward releasing more carbon, or even methane, which is many times more potent as a warming gas. But this change in the carbon cycle, Rothman says, is not instant, or even likely in coming generations. Studies of past extinction events reveal that when a threshold is reached, the process change may not trigger a global change until perhaps 10,000 years later. This is not the stuff of the near-term extinction crowd. But then Rothman says “we don’t really know” how the carbon system works. Despite a century of scientific study, and concentrated work in the last couple of decades, we still don’t know. That is very dangerous. At least with this study, Rothman is able to tell us what the threshold is – the level of carbon that could trigger the big slow release. That threshold can be measured in gigatons of carbon added to the ocean. He says 300 gigatons of carbon added to the seas would do it. We’ve added 150 gigatons since the industrial revolution, and most scientists expect we will put the last 150 gigatons by the end of this century. My take on this interview is that by 2100 we will indeed reach the trigger point for a release of those deep ocean stores of carbon, even thought the release may be thousands of years later! But the impact may not be evident for a very long time. If the carbon cycle change takes 10,000 years, it is like saying when humans first started farming, we began climate warming. Of course there are scientists who say that is true: agriculture began a slow climate change. But in this case, the result 10,000 years later would be mass extinction, a situation humans would be unlikely to survive. It’s like a long-term curse on the distant future. Meanwhile right now we are running a whole new experiment with atmospheric chemistry. Even conservative reports by the Intergovernmental Panel on Climate Change say we won’t have to wait long for climate disasters to become the new normal. My uneducated guess is that we are facing multiple processes. There is a very long-term cycle involving deep-sea carbon reserves. But everything else I get from climate science suggests there are also fast moving operations which can destabilize weather, and remap the coast-line, by the end of this century, and sooner than that. We need to know a lot more about fast and slow climate drivers, and the relationships between them. We’ll just have to keep going with research, and Radio Ecoshock, until we understand. But already there is enough evident in the melting poles, records set, and continuing disasters to demand rapid decarbonization. Do something! The rain forests of Indonesia are up for grabs. Never mind the indigenous people or the wild animals, step right up and clear it all away for palm oil. You just need a shell company or two, and bags full of money for local governors. That’s the sad story coming out of the island that used to be called Borneo. It’s all laid bare in some great investigative reporting from Mongabay and the Gecko Project. We have Philip Jacobson, the Indonesia editor for Mongabay on the line. You can read the first installment of the whole four part series here.”Palm oil fiefdom: how local officials in the post-Suharto era turned Indonesia’s rainforests into personal piggy banks“. Philip Jacobson is a journalist based in the Indonesian capital of Jakarta. 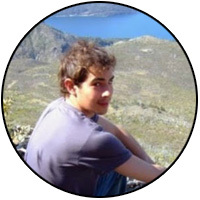 You can read some of his other articles for Mongabay here. The long investigations (very hard to do!) was done in partnership with the Gecko Project. They have several parts in the series, along with video and photos. Palm Oil Fiefdom also has 4 short videos with people in the stories. Find them on Facebook for MongaBay or the Gecko Project. Just as we spoke, there was the exciting discovery of a new species of Orangutan. Those great red apes are so shy, we did not know. It’s possible that up to one third of all supermarket items in the West contain palm oil. It’s everywhere. In Asia, palm is the number one cooking oil – imagine the vast quantities. Beyond that, some electric power plants burn palm oil, claiming it is a “green” biofuel! Some of these tanker loads of palm oil come from Malaysia, but the biggest plantations are found in Indonesia. This program looks at a study done by the environmental news site Mongabay about the impacts of booming plantations. Palm oil plantation, Indonesia, photo courtesy of Mongabay. 2. when the best forest lands were used up, the Indonesian government allowed tropical peat lands to be drained and converted to palm oil production. When the peat is drained, it become available to burn. Peat can be ten or twenty feet deep, burning underground, very hard to put out. 3. the fishing was disturbed and water polluted from the agricultural fertilizers and chemicals running off the huge palm oil plantations. 4. the smoke from burning off those forests and peat lands spread over southeast Asia. The smog endangered and likely killed countless people. 5. this smoke and forest loss was made worse by rampant burning of lands to clear them for agriculture. 6. the carbon released from forests and peat at time launched Indonesia into the third largest source of greenhouse gas emissions on the planet. This happened during the year of 1887/98, and again in 2015 (at least during the peak burning months). Considering the small size of Indonesia industry and transportation, it’s amazing they became gigantic sources of climate-damaging carbon. Everyone in the world, and all species, are affected by that. Beyond all that, as this investigation by Mongabay lays out, the rush to create palm oil plantations was very hard on the new Indonesian democracy, and a disaster for many aboriginal people there. After the centralized dictatorship of Suharto ended in the late 1990’s, one hope for more democracy was to delegate more decision making to the various regions of Indonesia. Remember that country is made up of thousands of islands, large and small. But this idea went wrong when local elected governors, called the Bhupati, engaged in wholesale corruption. Vast areas were licensed to a billionaire family in Indonesia (who developed equally vast plantations) and other big corporations in Malaysia (who have developed less). Through sophisticated shell companies, the bribes to the governor, his family and cronies, were taken out of the local economy. The aboriginal people did not really benefit from this land rush, although there are some small, scattered palm oil plantations run by aboriginal people. Even lands supposedly protected as National Parks were turned into palm oil plantations, with no one to enforce the laws. It’s a runaway industry, and we all use the products without thinking or taking responsibility for what is happening on the ground. The ownership of the land was supposed to be owned by indigenous communities, who had no paper deed, and were not recognized by the central government (who thinks they are squatters). Land conflicts followed, some places were bull-dozed, protests and road blocks followed. The riot police arrived to defend the company interests. 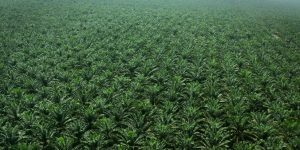 Unilever and Pepsi buy palm oil from Indonesia. The palm oil supply chain is complex. Unilever is the world’s largest user of palm oil. They have committed to purge their purchases from human rights violations, peat burning, etc. That is just starting to reach the plantation level, and it’s hard to implement. The supply chain is hard to trace, being so complex, so no one is sure where it all comes from, and whether it’s green and clean. The industry is expanding to Papua, the new frontier. International people can help: the Indonesian government is concerned with their image abroad. If you can afford to help keep this program going, please consider signing up to donate $10 a month. That is how I pay the bills. Please find out how here. This concludes my series on forests and climate (for now). Check out my web site for that half dozen interviews on this subject in recent programs. Next week I’ll be starting my investigations into new science about how climate change directly affects your health, and your chances of a long life. Stay tuned to Radio Ecoshock.